​What's on your wish list? ​As a pet professional, you are used to putting others first. Take a moment and think about making your own life better. What do you wish could be different? Do you wish you had more energy? Imagine what it would be like to work a full day, run a few errands on your way home, and not collapse in a heap at the end of the day, picking dog hair off your shirt and rolling it into a little ball. Would you like better clarity? Wouldn’t it be awesome to give your clients advice and then not spend the next 48 hours replaying it in your head wishing you’d said or done something differently? How about more laughter, more fun? When was the last time you really, truly laughed? No, chuckling at a coworker’s snarky comment doesn’t count. Do you wish you could restore your enthusiasm and rekindle your drive? You were drawn to working with animals because you could make their lives better, but lately it feels like you’re just moving in place, not really making a difference. Sometimes you even wonder if you should make a big change, get a different job, because surely work doesn't have to be this hard. Would you like to get more done? Imagine finding ways to be more efficient and more effective so that you can help more animals with the same amount of time and effort (or even less time and effort!). Do you want to find yourself again? Wouldn’t it be great to reach inside and reconnect with who you really are and what is most meaningful to you? ​You can grant your own wishes! Yeah, yeah, yeah, you’ve heard it all before. You’ve read articles and maybe even books with titles like “Five Easy Ways to Feel Better.” And they didn’t work. You know why they didn’t work? They didn’t work because they weren’t about YOU. They didn’t take into account your strengths, your challenges, and the many demands on your time and attention. They tried to overlay new habits on top of old patterns … and a whole lotta baggage. So, you’ve got baggage. So what? We all do. When you look around and think you don’t measure up, you are making a common mistake: You’re judging your insides against their outsides. Odds are the people you work with are struggling with stress, burnout, and compassion fatigue just as much as you are. It’s a pervasive problem in our world, and it’s time to fix it. The trick is finding the strategies that will work for you. The real you. The one who cares deeply—and sometimes wishes you didn’t. The one who will always go the extra mile for an animal in need, but feels guilty taking an hour-long lunch break. The one who can’t imagine any other career, but also feels so worn down that you wonder if you’re even helping. The one who sometimes fanatasizes about getting a nice office job, which would have to be easier than the stress of dealing with animals and their people (mostly the people!). You need a chance to try out some different strategies, to think about what you like and don’t like about them, and to identify ways you could incorporate them in your life. You need a safe place to dabble and learn. Change requires awareness, practice, and reflection, but how are you going to find that? This group was incredibly helpful for me. I felt uplifted and supported by the group. I gained new insights and learned multiple new strategies that have made my work and home life more meaningful. I was sorry when the class was over! ​That's where UNLEASHED RESILIENCE comes in! 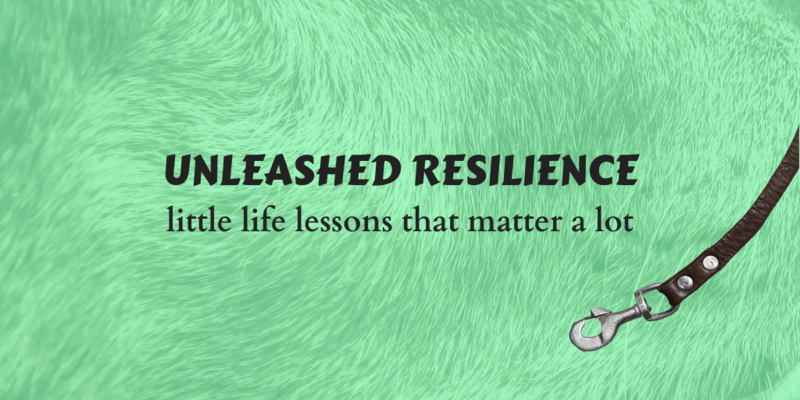 ​Each UNLEASHED RESILIENCE group is a small learning community where you’ll have the chance to explore some of the concepts of positive psychology. And what that really means is it’s the study of how to thrive. Traditional psychology focuses on what’s wrong with you, but positive psychology helps you see what you do well and teaches you how to find more joy, meaning, and purpose in your life. Awesome, right? I sure think so. ​The UNLEASHED RESILIENCE group has been absolutely incredible! The course covers many unique and thought-provoking topics, in a very comfortable and casual style, allowing for participants to go at their own pace, surrounded by supportive conversation and encouragement. I found myself looking forward to these weekly meetings and will certainly be attending more in the future. Thank you, Colleen, for providing such an opportunity! ​So what exactly is an UNLEASHED RESILIENCE group? ​You work so hard every day making the world better for animals that you sometimes forget to take care of yourself. Or maybe you've internalized the message that self-care is selfish and think you just need to toughen up, buckle down, and get back to work. If so, you’ve got that backwards. Completely backwards. UNLEASHED RESILIENCE groups are made up of talented, dedicated, kind (and, yes, tired) pet professionals who understand how hard your work really is. They get it in a way that your friends and family cannot. In each session, ​we'll discuss and practice a specific skill ​designed to fill you up mentally, physically, socially, or emotionally. This way you can figure out what works best for YOU. There are no one-size-fits-all strategies here. Identifying your signature strengths, which will help you see what special talents you bring to the table. Most people have no idea what their personal gifts are. Do you know yours? Do you know how to use them deliberately? You will! Reframing negative mind chatter to shush that cranky voice in your head. You’ll learn to work with your worries and doubt your doubts. Increasing your self-compassion because, quite frankly, probably no one is meaner to you than you are. Getting a little clarity about why your brain is dives into “compare and despair” mode will help you avoid this particular landmine. Figuring out what triggers emotional responses in yourself and others. Most issues can be traced back to five common triggers. You’ll use this skill over and over with clients, coworkers, and even to question yourself when you’re starting to spin up. Establishing and maintaining boundaries because, guess what, you’re not good at this. (Yet.) Whenever you catch yourself feeling resentful, it’s likely that you either didn’t set a good boundary or decided not to enforce one you thought you had. Improving communication with the people you care most about. This one is going to surprise you. Most of us think we’re good at communicating with the people we really care about, but there are a few unbelievably common mistakes we make. But now you’ll be able to avoid them! ​Sign Up for an UNLEASHED RESILIENCE Group Now! ​​These special groups are designed just for you. Six weekly 90-minute sessions. Long enough so you have time to practice your new skills at work and at home. Short enough to squeeze into your busy life. Zoom classes. In-person, interactive training delivered right to your home. Join us in your pajamas if you want to. Small groups. With no more than 10 people per group, you’ll be among kindred spirits and will feel safe, understood, and valued. Interactive format. You’ll be an active participant in the group discussions. True learning doesn’t come from lectures; it happens when you figure out how the new information applies to your real life. Variety of topics. This is your opportunity to experiment. There’s no one-size-fits-all game plan. You’ll try new things to figure out which strategies work best for you. Casual atmosphere. I know that you are creative, resourceful, and whole. Show up just as you are. You’ll be accepted and not pressured to change. At the risk of sounding clichéd, this course is nothing short of life-changing. I didn't know that many of the concepts learned were even a thing, and the course offered an exceptional way of internalizing them in a low-pressure and non-intimidating way. Colleen is an amazing instructor, knowledgeable and empathetic. I can't recommend this enough, and I mean this in earnest. I am extremely grateful to have been part of this course. ​Which Group Should I Choose? There are three different UNLEASHED RESILIENCE groups: purple, green, and blue. Each one covers a different set of positive psychology topics. There’s no hierarchy between them. You can take one, or you can take them all. Note: The magic of these groups is in your participation. The sessions are not recorde​​​d and cannot be watched later. Please only register for a group if you can attend at least five of the six sessions. ​Self-care isn't easy for many of us and can feel uncomfortable ... we don't have time, it feels silly, etc. This course makes caring for yourself easy ... no guilt, no pressure, just a method to move toward self-care that can change your life, not just for you, but for your family and the others you serve. Stay Tuned: New Format Coming this Fall! Positive psychology focuses on wellbeing, happiness, flow, personal strengths, wisdom, creativity, imagination, and characteristics of positive individuals, groups, and institutions. In short, it’s focusing on "what’s right with you" rather than "what’s wrong with you" and finding a path that moves you forward. These are casual, interactive sessions, and each session will follow the same basic format. We’ll start with a quick check-in. Then I’ll share some positive psychology information. We’ll do one or two exercises as a group, and I’ll share some of the research so you understand the WHY behind the activity. Then we’ll talk about the experience to see how it felt and what elements of it could be applicable to our own lives. The answers will likely be different for each of us. We’ll close with next steps and a centering activity to think about until our next meeting. I’ll facilitate to ensure that everyone has an equal opportunity to take part (and I’ll also be a full participant in the group). You can share as much or as little as you’d like. No pressure. We’ll be learning together in a small, supportive group. What if I can't attend all six sessions? Since each group will be building its own small community built on trust and shared experience, participants cannot make up a missed session in another group’s timeslot. Outside of class, how much time will this course take? That's up to you. This is just an invitation to try things out in your own life. There’s no required homework. We’re playing, not working! For some sessions, I may suggest a specific assessment or activity. None of these takes more than 15 minutes and all are optional. Can I earn continuing education credits with this course? Yes, the program has been approved for ​credit from the International Association of Animal Behavior Consultants (IAABC, 13.5 CEUs) and the Certification Council for Professional Dog Trainers (CCPDT, 12.25 CEUs for trainers and 1 CEU for behavior consultants). ​You must attend all six lessons to earn CEUs. While I am a RACE-approved instructor, the program has not yet been submitted for American Association of Veterinary State Boards (AAVSB) credit. I'm working on that. Are there other groups or associations you belong to that I should contact for continuing education credits? If so, please let me know. Zoom is a web-based program that allows us to come together as a group where we can see and talk to one another. ​You don't need to buy any software to run Zoom. When you register for the class, I’ll send you an email with a link that will give you access to the classroom.